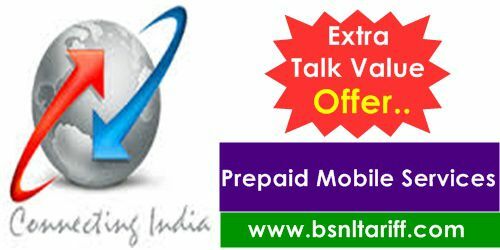 BSNL Mobile has announced the promotional basis offer for Prepaid plans mobile subscribers for a period of 4 days under GSM services. State run Telecom Company Bharat Sanchar Nigam Limited (BSNL) has launched promotional offer on GSM Topup Voucher denomination of Rs.490 for Gujarat Telecom Prepaid plans mobile customers from 27th October, 2016 onwards. As per latest information, BSNL’s competent authority of Gujarat Telecom Circle has decided to offer 30 percent Extra Balance Scheme on Prepaid Topup voucher of Rs.490, for a period of 4 days. Under this scheme, Prepaid mobile plans customer on recharging Topup denomination of Rs.490 will get Extra Balance of Rs.550 (Including ST) instead of regular balance of Rs.423 (Excluding ST) during this offer period in Gujarat Circle. The above promotional Extra Balance offer will be implemented with effect from 27-10-2016 and available upto 30-10-2016 for Gujarat Telecom Prepaid plans customers.